"Stick a fork in me, I'm done." He's a patron saint of librarians because he sacrificed his life to save Church documents. He's the patron saint of cooks because he knew what it was like to be on the wrong end of a basting brush. And he's the patron saint of comedians because he was dying onstage yet still riffed a wisecrack. The only Church deacon (of seven) to survive the Emperor Valerian's persecution in 258, St. Lawrence was afterward soon arrested for refusing to turn over Church treasures. By legend he was grilled to death and is said to have had the presence of mind to joke to his torturers, "I'm done on this side; turn me over." There but for a consonant a myth is born. In the early twentieth century historian Rev. Patrick Healy postulated that the tradition was based upon a simple error. The Church formula for announcing the death of a martyr, Passus est ("he suffered," i.e. was martyred) was mangled, the "P" early lost in transcription, and Assus est - "He roasted" - became the received truth. Not that Healy's hypothesis was accepted. It threw cold water on St. Lawrence; the faithful prefer the fire. "When the legend becomes fact, print the legend" (The Man Who Shot Liberty Valance). "His charred body was claimed by the Christians, and his mummified skull is still in the care of the popes. 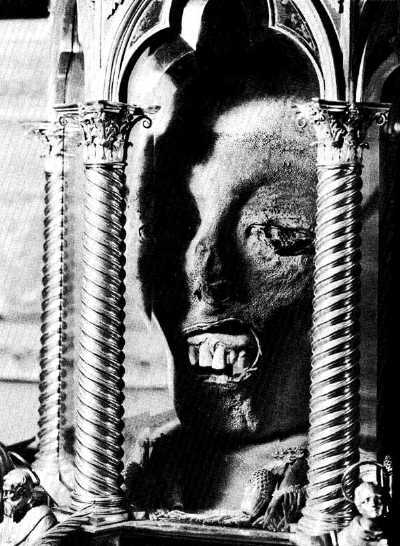 At the Vatican on the tenth of August every year they expose in its golden reliquary the head of Saint Lawrence that still, in the distorted mouth, in the burned bone of the skull, shows the agony he suffered to defend the archives of the popes" (Maria Luisa Ambrosini and Mary Willis, The Secret Archives of the Vatican. New York: 1996, p. 27). Another apocryphal story, by way of Father Jacques Marquette, is that St. Lawrence inspired the classic Julie London hit tune Cry Me a River before being beheaded (his likely demise). It is not true, however, that the story of St. Lawrence inspired Peter Greenaway's 1989 cinematic salute to roast human, The Cook, The Thief, His Wife & Her Lover. Image of St. Lawrence courtesy of Infolit, with our thanks.